For this weeks Flash Back Friday we head back to the 2002 season, the season which would see the NZ Warriors make their debut appearance in a Grand Final. which ultimately saw them claim their first minor premiership, albeit thanks to the Bulldogs being stripped of 37 points due to salary cap breaches, the Warriors faced the 8th places Canberra Raiders in the first week of the finals. The Warriors went on to win the game in convincing fashion 36-20. Next up they faced the Cronulla Sharks in the preliminary final. In front of 45,00 fans at Stadium Australia, many had tipped the Sharks to run away with this game. The Warriors on the other hand, had other ideas. 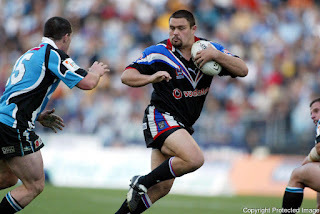 As the game approached the 20 minute mark, with the scores locked up at 0-0, Cronulla's Paul Mellor was wrapped up in a tackle, being forced backwards by Motu Tony and Richard Villisanti. In an attempt to get his side out of trouble, Mellor slipped a pass under pressure, falling straight into the waiting hands of Motu Tony who ran 25m to open up the scoring. With Ivan Cleary's successful conversion, the NZ side led 6-0. As the 30 minute mark approached, Mellor was again the man involved in another Warriors try scoring chance. On the last tackle, Mellor put a grubber in only to be picked up by Stacey Jones 5m out from his on line. Once Jones picked the ball up he saw he had nobody in front of him and sprinted away into open pastures. With his opposite #7 in hot pursuit and with Meli on his inside, Jones put in a kick which resulted in a foot race between Meli and Mellor. As Meli was about to pick the ball up only metres away from the try line, Mellor managed to get his foot to the ball and kick it dead, denying the Warriors a certain try. Early into the 2nd half, a cross field kick from Brett Kimmorley resulted in a try to Matthew Rieck. A missed conversion left the score at 6-4 in the Warriors favour. Shortly after the Warriors try, Kimmorley sliced through the defence to score right next to the posts. With the easy conversion being slotted over, the Sharks leveled the scores 10-10. With 5 minutes to go, Stacey saw open spaces behind the Sharks defence and with a perfectly weighted grubber into the in-goal, John Carlaw managed to pick up with ease and dot down right next to the posts. With the conversion this gave the Warriors a 16-10 lead with only minutes remaining and would prove to be enough to send the "sleeping giants" of the NRL into their maiden Grand Final.